The theme this year for National Nutrition month is, “Eat Right…With Color.” The challenge? To swap out calorie dense starches and fats for fruits, vegetables and whole grains. This month we have joined the leagues with the National Dietetic Association; in addition to, the many accompanying voices of dietetics from the Pacific to the Atlantic oceans to promote healthy habits. We discussed ways to filter out the high calorie prepackaged foods by reading labels; checking for ingredients that are closest to nature. Sadly too many products on the supermarket and natural food store shelves posing as food are really un-food. Fortunately for us today we do not have to spend the day in the kitchen preparing meals. There are honest companies out there producing products without the harmful additives and preservatives. Be sure to always check the labels. The following week we posted links to help our pickiest eaters over come their food fears. Be Patient and keep offering them the good stuff. One day they will surprise you. We would like to wrap up National Nutrition Month with a guide to seasonal foods. 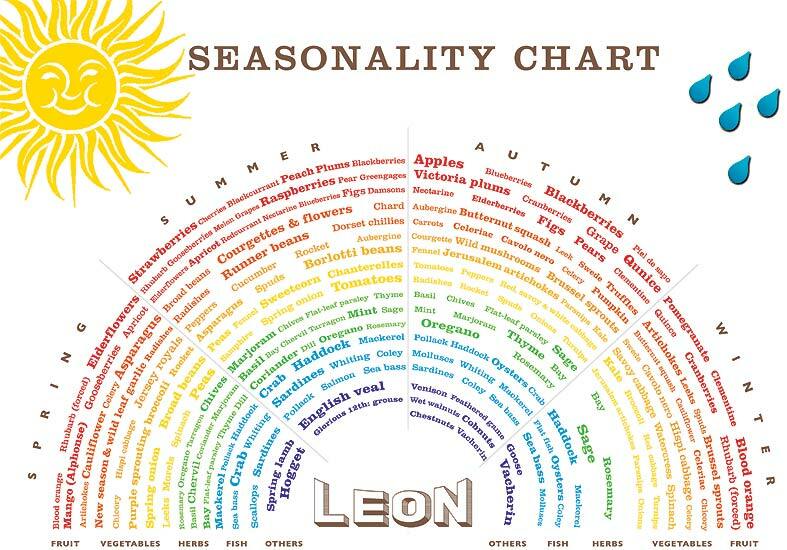 “Eat the Color of the Rainbow“…”Eat Clean”…”Eat Seasonal”…What does this all mean? Food is fuel for our body. Each morsel of food contains within it nutrients and minerals our body needs to boost the immune system, help cells and organs function properly, and support growth and development. Eating a variety of foods (the color of the rainbow) is the best way to get all the vitamins and minerals our bodies need each day. Eating clean is the practice of eating whole, natural foods and avoiding any manmade fats, sugars, dyes and preservatives. Let’s say one sweet potato has the same amount of carbs as a candy bar. Even though the potato is largely a carbohydrate it has less sugar and calories and more soluble fiber than the candy bar. The potato also has zero harmful preservatives (such as BHA, BHT and TBHQ) or food dyes (made from petroleum). The health benefits of a starchy potato far outweigh those of the candy bar. Whole, unprocessed, foods like seasonal fresh fruits and vegetables, whole grains, low-fat dairy, fish and fresh lean meats provide the nutrients our bodies need to grow properly. Raise Healthy Eaters: Wonderful spot for everything you ever needed to know about feeding children. The Gracious Pantry: How Tiffany transformed her pantry filled with junk food to one that supports clean eating habits. Nut Shell Nutrition: “Make a Rainbow on Your plate”, also be sure to peruse the site. Brittany has several informative posts on making health goals that might be of interest. Dish on Dieting: A witty article describing the use of a GPS to guide us down the road of meal choices. A Sprinkle of Sage: “What’s Your Nutrition Resolution?” The first of a month long series of tips to reach this month’s goal for optimal health. Kleiner Nutrition: Great articles to help inspire us to stay on the path to better habits. Be sure to check out the interview with Hope Warshaw.